This is only just barely a spoiler post for last week’s JSA episode of SMALLVILLE. This is only just barely a spoiler post for last week’s JSA episode of SMALLVILLE . Well, let’s consider this for a moment. One, this means someone in the Smallville universe actually dressed like Mr. Terrific, whom you can see on the end there, “FAIR PLAY” on his belt an’ all. But, you know, that’s okay, because all things considered, we probably shouldn’t be splitting hairs over who has the goofiest costume. And at least he had a proper superhero costume, Clark. Third, Hawkman tells Clark that he and his team were active “before they were in diapers.” Er, before Clark and his friends were in diapers, that is. So assuming Clark’s age in the show is — maybe early 20s? — and given the apparent ages of the JSA members, that would put Smallville ‘s Golden Age (as it is more or less described in dialogue) in the mid to late 1980s. So we had Reagan (and later, Bush Sr.) as President, Billy Idol, Members Only jackets, Charles in Charge , and the JSA. Sure, why not. READ MORE ABOUT IT: Relive some of the highlights of Twitter’s “Drunkville” liveblogging at Chris Sims’ website, with special guest star Kevin Church. So if the JSA started in the ’80s, that puts a whole new spin on Hourman’s source of his powers. As someone who has been watching Smallville with snark and intoxication for years, I was prepared to really lay into this episode but I thought it was decent. I’m still surprised that people mistake the TV Smallville universe for the DC comic-book Superman universe. They’re not the same. Obviously in this TV universe, Clark doesn’t become Superman – or if he does it’s much later than in the DC universe. Another immediate difference, of course, was that Clark was at high school in the early 2000s and thus from a different generation than the DC version. Even though differences were established from the very beginning, people still expect it to be the same as the comicbook. Weird. Can I tell you have much enjoyment (way too much, in case you were wondering) from your hypothesis of what/who Smallville Spectre would really be like. HI-larity! CW – She’s in the episode! I don’t watch Smallville, but I saw a picture of some of the JSA online… I have to say it looks like they got Doctor Fate right… how did he sound/act? 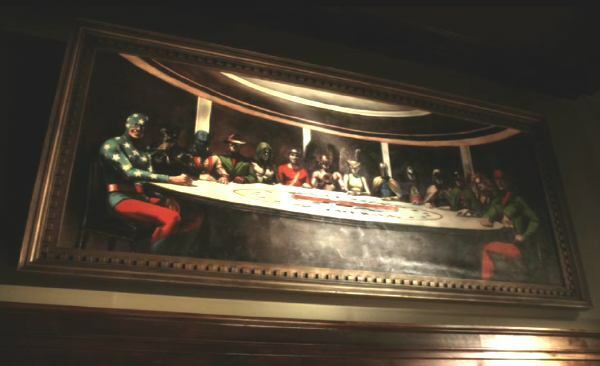 The guys who restored Da Vinci’s “The Last Supper” really screwed up! Don’t forget he got a job at a major newspaper without any experience after writing a few articles in his high school paper and then dropping out of college. And by ‘job’ I don’t mean working in the mail room, the guy writes front page stories (and comes and goes as he pleases). Noone is saying the show has to exist in the same universe as the comics,but is it completely insane to assume a Superman show about an adult Clark Kent working at the Daily Planet would feature Clark donning the guise of…….Superman? Espescially since,and I’m sure you’re already aware of this,the creators always give lameass reasons he’s not Supes,like it’s “corny” or “unrealistic” to have him wear tights and fly,but Hawkman and Dr. Fate are the type of people I often run across in my day-to-day life. JSA the greatest superheroes of the Vietnam War…Era. The costumes make more sense in the 60s & 70s than the 80s. Go look at the time & the pretty outlandish everyday clothes people wore. There were a lot of young people wearing thrift shop clothes back then and they were affordable too. Allan Scott why obviously he was looking at some antiques for his bachelor pad when he came across the Green Lantern, Mr.Terrific I don’t know that guy was always weird. Hour Man, people have been popping bennies for a long time. The frame up also coincides with the counter intelligence operations going on then against domestic groups especially in the anti war, civil rights movements. Y’know, I get the feeling no one really thought through the political implications of a group of folks who decided put on masks and fight street crime in the late-60s/early 70s. I SO WANT that picture…. it would result in divorce threats from my wife, but it would totally be worth it! Mike, Ma Hunkel’s really in the episode? Wow, that’s something I didn’t expect! CW – Me neither. But there she is, tornado logo on her apron and everything. Just a brief glimpse, but it’s enough. g23 – Dr. Fate wasn’t bad…kind of a different take on Kent Nelson, and there was a neat glowy-red effect in the helmet’s eyes. Over all the episode was pretty great. In an over the top cheesy kind of way. The thing that got me about the timing of this episode’s golden age was – yeah, workign on their ages at the time of the episode, you’d be talking the 80s, or maybe the 70s, but why does that mean that all the footage of their arrests (and what professionally lit and staged footage it was…) should then be on reel-to-reel film? What, the Metropolis police force didn’t upgrade to camcorders until the 90s? @Kid Nicky – erm, the show was always about Clark Kent *before* he became Superman. It was always stated that we’d never see Clark dress up as Supes. That was what I though was meant by the “no tights, no flight” rule – i.e. it was specifically aimed at Clark. Of course, the original creators have left and so now we do get people dressed up in weird and wonderful costumes taken right out of the comic books that we all love. By the way, in the earlier seasons, Clark used to wear a red and blue costume. He’d often be wearing a blue t-shirt and a red jacket (that was somewhat reminiscent of the cape). That little detail used to make me smile. Of course, now he looks like the Connor Kent version of Superboy. 1) The costumes were pretty spot-on, except that (I agree) Hawkman’s mask looked a bit top-heavy and clunky. 2) Why did Michael Shanks (as Carter Hall) feel the need to invoke a Christian Bale gutteral growl whenever he spoke in character?? 3) Personally, I think Geoff Johns may have been trying to stretch/bend the spacetime continuum to make a group of spandex vigilantes who publicly met up in a brownstone and maintained a museum dedicated to their exploits and yet no one in Metropolis seems to recall them without digging through the archives of 8mm film and newspaper clippings work in the ‘present day continuity’ of Smallville. C’mon. Seriously? who WOULDN’T remember them?? 4) Thought it was funny the John Jones, at the end of the show, mentions he’s fond of cookies, but they couldn’t secure a product placement for OREOs or HYDROX. The ending was lame, I agree – too much power in one room, totally unnecessary to overwhelm a hyped-up helmet-wearing Icicle. For a moment, I thought that when he put on Fate’s helmet he would go insane or something, (and maybe become the Psycho Pirate!!) but, alas, no…. I think they showed Mr. Terrific’s little logo during the museum tour, and it was actually written on a weight belt. Which kind of makes sense (as much as anything in this show does).